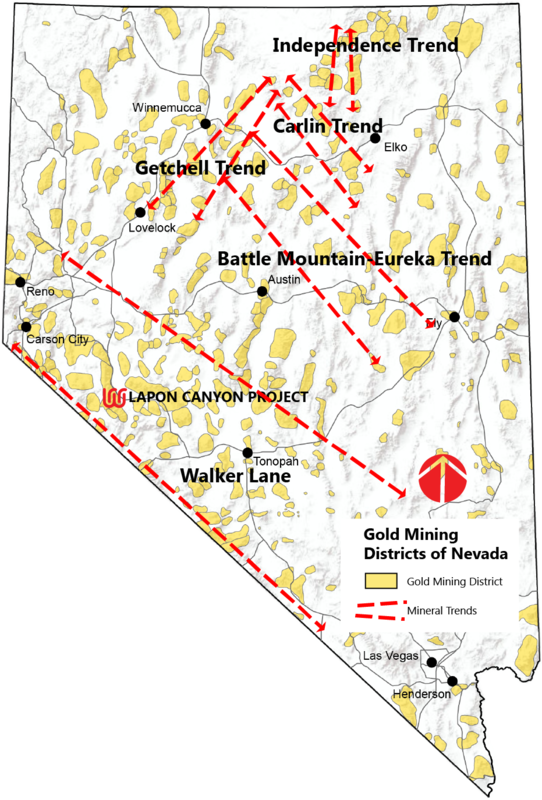 The Lapon Canyon Gold project, consists of 19 leased claims (the “Sleeper Claims”) and 17 lode claims (the “Lapon Canyon Claims”), for a total of 36 claims (720 acres-292 hectares), situated some 60 km south of Yerington, Nevada and is easily accessible via state maintained secondary roads from the main highway (25 km). It is located in a deeply incised valley (Lapon canyon) which is the site of historic gold placer mining in the 1900’s. The road up the canyon to the old mine site is accessible by 4WD. A power transmission lines passes within 3 km of the property. 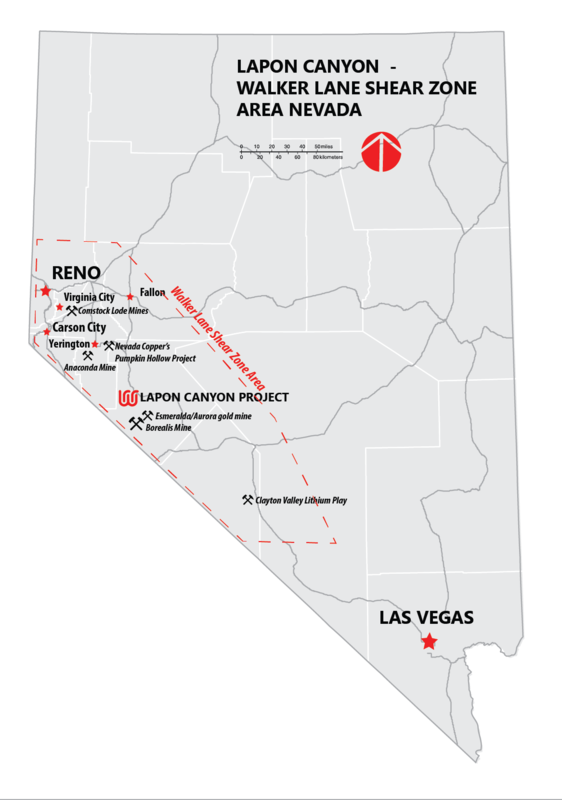 The Lapon Canyon Project is located within the Walker Lane Shear Zone, a 100 km wide structural corridor extending in a SE direction from Reno. The past producing historic Comstock Lode silver/gold mine is located within this trend, as is the past producing Esmeralda/Aurora gold mine, which is located 30 km SW of the project. as well as Gryphon Gold’s currently producing Borealis Mine located only 25 km south west of Lapon Canyon. 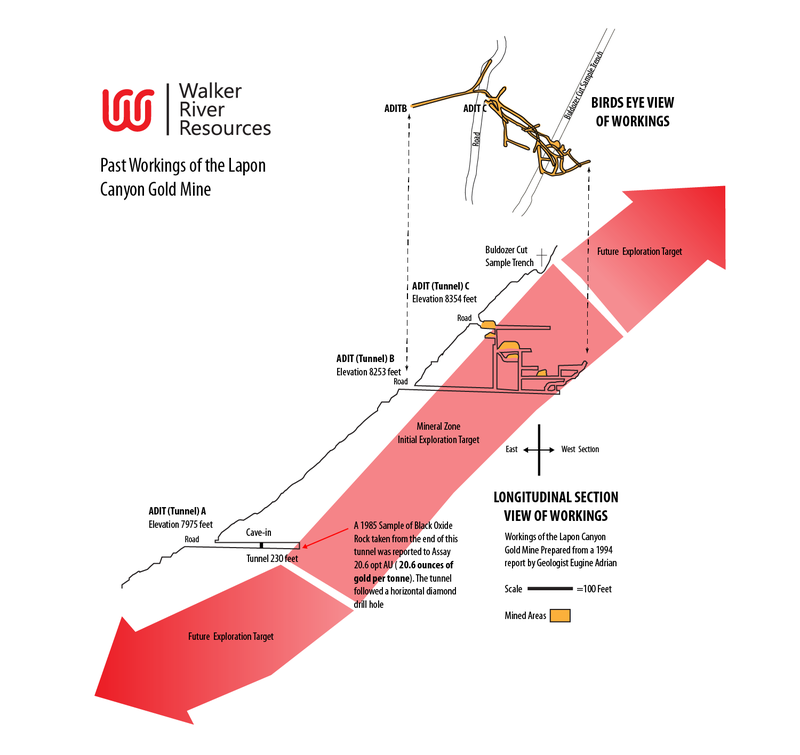 The Sleeper-Lapon Canyon Project is located on the west flank of the Wassuk Range within the Walker Lane Shear Zone. 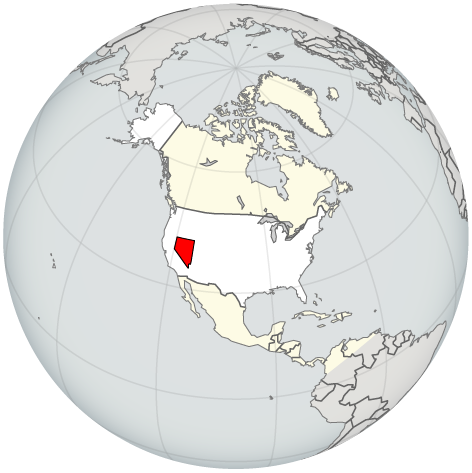 Walker Lane is a linear north-northwest-trending depression extending 800 km north from the Garlock Fault Las Vegas area to south-central Oregon. This trough is part of the Walker Lane Fault Zone, a major tectonic system that includes Owens and Death Valleys and several prominent faults. Located at the juncture of two contrasting tectonic styles, the Sierra Nevada and the Basin and Range, the Walker Lane region is deforming in a complex way by both extensional and transcurrent (sliding) fault movements. 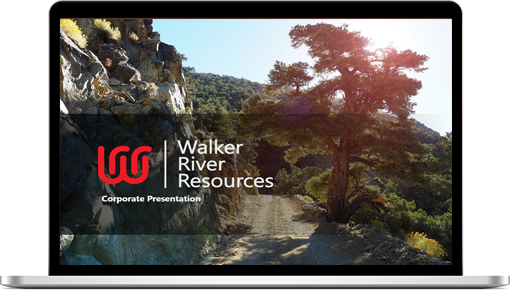 There is the potential for defining more high-grade gold mineralization on the property. Three steeply dipping, strongly altered and silicified fault/shear zones can be traced for about 4 km on the property. Each of these zones measures 60-to-300 metres wide and two can be traced up to 700 metres vertical extent – from the ridge top to the bottom of the canyon. Only one of these extensive alteration zones was partially mined. All of the alterations zones need to be properly explored and drill tested. These steep, cross fault structures within the NW striking Walker Lane structural trend could represent mineralized tension gaps that could tap into deeper feeder structures fed by underlying Cretaceous-aged intrusive rocks. Small-scale high-grade gold mining occured from 1914 onwards. The mine area was at the top of the canyon and at that time it was extremely difficult to access. 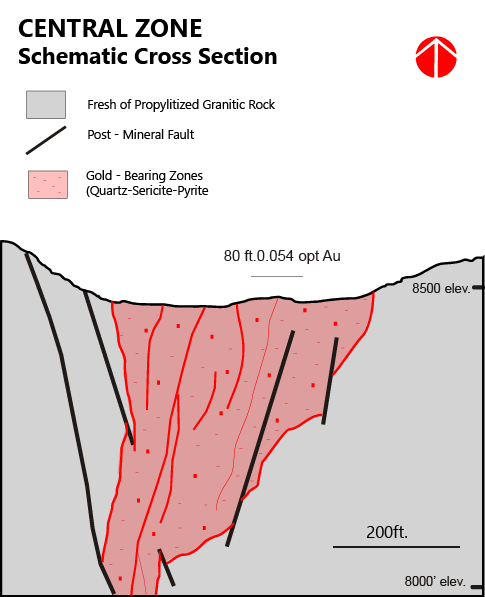 This indicates mineralization was rich enough to drag equipment and supplies up a steep canyon. Two adits were developed (B and C) with a sublevel and raise between them. About 600 metres of underground adits and drifts were developed and a two-stamp mill was built. Cut-off grades in the stopes were reported to be 1 ounce gold per ton. 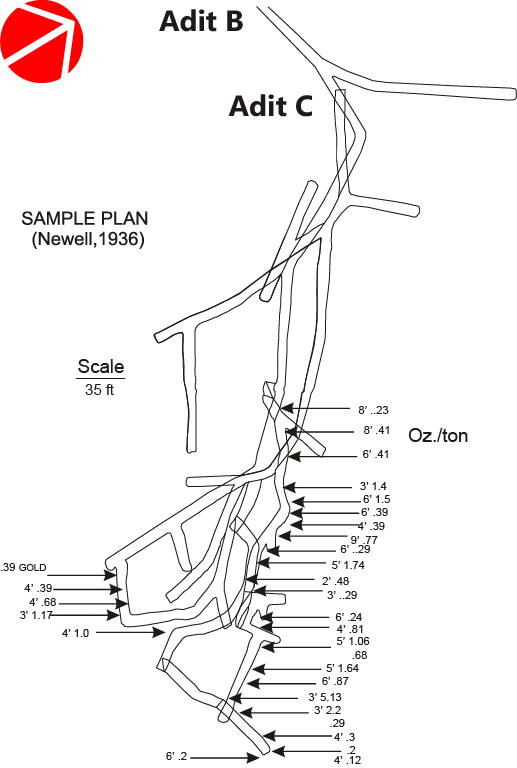 In 1936 Newell sampled the adits and published values assaying as high as 5 ounces gold per ton. 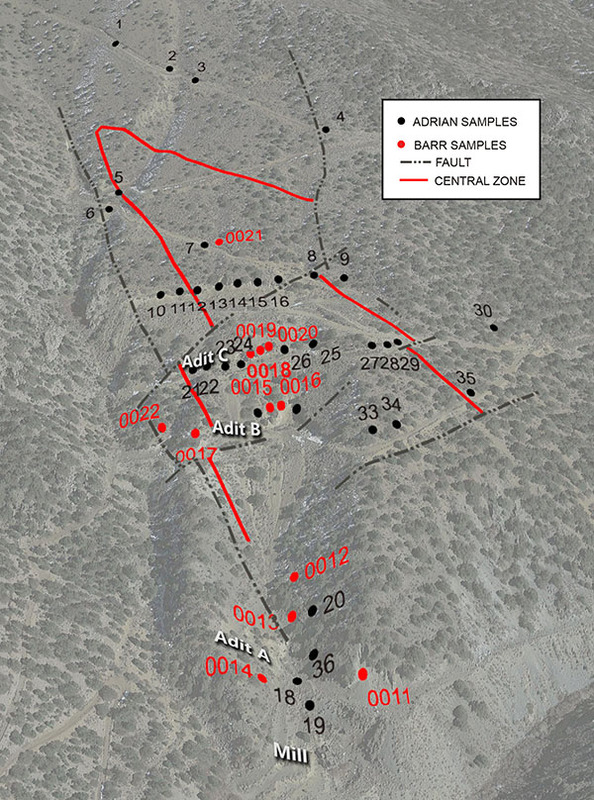 In 1960, Nylene drove an adit 250 feet into the mountain and 275 ft below adit B.
Nylene was targeting the down dip extension of the high-grade mineralization above. A sample taken at the end of this adit reportedly assayed 20.6 ounces gold per ton. In the 1960’s a small mill was built and a tailings pond was constructed. A second larger ball mill (500 tons per day) was to be installed but the company ran out of money and abandoned the project. The 500 tpd mill still remains at the base of the canyon, uninstalled. No further mining work was reported. In the 1990’s some minor trenching and a few shallow RC drill holes were drilled above the the uppermost adit. No one has tested the down-dip extension of the high-grade gold ore shoots that were being mined in the 1960’s. The Nylene Adit potentially hit this mineralization which warranted the expansion of the mill (to 500 tpd). But it seems company apparently ran out of money before it could profit from the discovery.